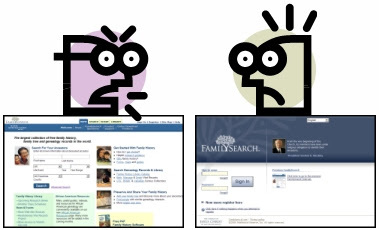 Last week, Don Anderson (whom I assume to be the Don Anderson, Director of FamilySearch Worldwide Support Services) announced on FHCNET that any ordinance submitted via TempleReady and completed since 1-January-2007 are not showing up in the New FamilySearch. A backlog has built up and it will take some time to get this information from the IGI into the New FamilySearch. One user reported none of more than 70 ordinances submitted this year have shown up in the New FamilySearch. Until the problem is corrected, users of the New FamilySearch (currently, just the St. Louis temple district) are advised to search the IGI before submitting names via New FamilySearch. Anderson further revealed that ordinances submitted via the New FamilySearch will not show up in the IGI when completed. No word was given as to whether this is a temporary or permanent limitation. And no method was provided for TempleReady users to avoid duplication of work done in temples using New FamilySearch.